One of the bigger disasters for Rupert Murdoch in the last few years – bad behavior on his British papers aside – was Myspace. The Australian media baron picked it up for some $580 million in 2005, which looked initially like a good move. It wasn’t – last year, he sold it on for a paltry $35 million to Specific Media (with Justin Timberlake of all people, hot on the heels of The Social Network, buying up a stake too). Its new owners are now going to relaunch it, building the code from scratch – but this must surely count as the last throw of the dice. The sheer speed of Myspace’s fall from pre-eminence was pretty surprising. Facebook did not overtake it until 2008, but since then the competition has been embarrassingly one-sided. Myspace went into that battle with a more fully-featured platform than its upstart rival and an large already-existing user base, but that wasn’t enough to win. Old web sins, like feature creep and buggy code, didn’t help. Fundamentally, however, the infrastructure of Myspace was, for all its forward-thinking social networking features, was ultimately pretty Web 1.0; anonymous and often crudely customised profiles had the whiff of Geocities about them, and discussion took place primarily on an old-fashioned bulletin board format (and an uglier one than most PHP-based web forums at that). There was nothing quite like Facebook at the time. But what’s really changed is that the different social networks are not really competitors. LinkedIn is not poaching people from Facebook; Twitter is not at war with Pinterest. There are skirmishes at the borders, but what has emerged is a general division of labor between them, with the big hitters dominating their own niches rather than the social networking ecosystem as a whole. The underlying difference is this – rather than competing for ownership of a person’s online existence as a whole, social networks now accept that they will be the tools of the users. If Myspace wants to compete again, it needs a niche. Alongside the polished trailer for the new Myspace, which mostly shows off a pretty tiled design, we are promised that the core priority will be music, which is probably wise – previous attempts to relaunch on this basis failed, but these attempts were insufficiently focused. The broader picture is dominated by Facebook – and competitors thrive where they do things better than Facebook possibly can. Twitter can spread news and opinions faster. LinkedIn provides a form of networking designed from the ground up around work – rather than (as with Facebook) retrofitted from something designed around college students. And Facebook isn’t a brilliant media platform. People upload pictures – but overwhelmingly snaps of themselves and their friends rather than works of art. Streaming capabilities are buried away in a general purpose ‘page’ system. There are few musicians of any renown not on Facebook these days, of course, but it is hardly cut to measure for their needs. That’s not to say people aren’t finding interesting ways to interact with fans. At one end of the scale is the paradox of ultra-independent bedroom labels building their insular, fiercely loyal cult audiences and old-fashioned vinyl sales through the likes of Facebook. At the other, there’s elaborate and fan-pleased arrangements like the tie-in with Benji and Joel Madden of Good Charlotte’s tie and KFC in Australia, which involves collecting stories of good times from Australian fans that will feed into a future song by the band. That’s one lovably amateurish and one professional and sophisticated way of marketing through social networking. Yet, both strategies are at one remove from the actual music. Where music does appear on Facebook, it’s in a cramped embedded video or something similar. What Myspace could do – with the teaser trailer’s visually stimulating new interface and a serious musical infrastructure – is provide a real social networking platform for artists in all kinds of different media. 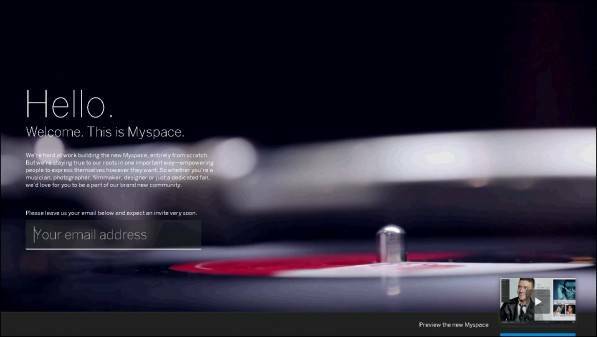 Myspace once was the major hosting service for artists to stream free music, after all. While competitors like Soundcloud and Bandcamp are useful, their social features are primitive or else carved up by paywalls. Add in decent ways to share other forms of art, with serious integration into the broader social networking cosmos, and there could be a future for Myspace. Just because Rupert Murdoch failed doesn’t mean Justin Timberlake will too. Previous story What is a Branded Domain and What we can Expect in near Future? I think Justin Timberlake is counting on the music industry to save MySpace. Personally, I think MySpace’s inability to stop all the spam and the painfully slow design update really did them in. I can’t wait to check out the redesigned MySpace though. “Myspace wants to compete again, it needs a niche” – This is absolutely right. Myspace needs a reason to exist, it should focus something totally music related I guess to survive. A social network of music would be cool !